For the civil wedding of Barbara and Alexander I was allowed to be their wedding photographer in Zurich. The bride was very pregnant. Of course that didn’t make the whole thing any easier for her. What kind of wedding dress would fit? Doesn’t the child come too early? These and many other questions circled around her head. We met in my studio 1.5 weeks before the wedding. Barbara and Alexander decided rather spontaneously to capture the wedding in professional wedding pictures. Another golden autumn day. The luck of the weather in October was completely with the bridal couples. Barbara dressed directly in the shop of Las Perlitas. It is specializes in festive maternity fashion for pregnant women. The bride was accompanied by her parents and sister. After the last adjustments to the wedding dress it now sat perfectly. What shoes? Barbara couldn’t make up her mind at first and took two pairs with her to be on the safe side. It quickly became clear which would fit best. Alexander was already waiting impatiently in front of the town house. Barbara was accompanied by her father and already handed over to Alexander at the “First Look”. The small company gathered at the same time. Now it could start. All guests took a seat in the wedding room. 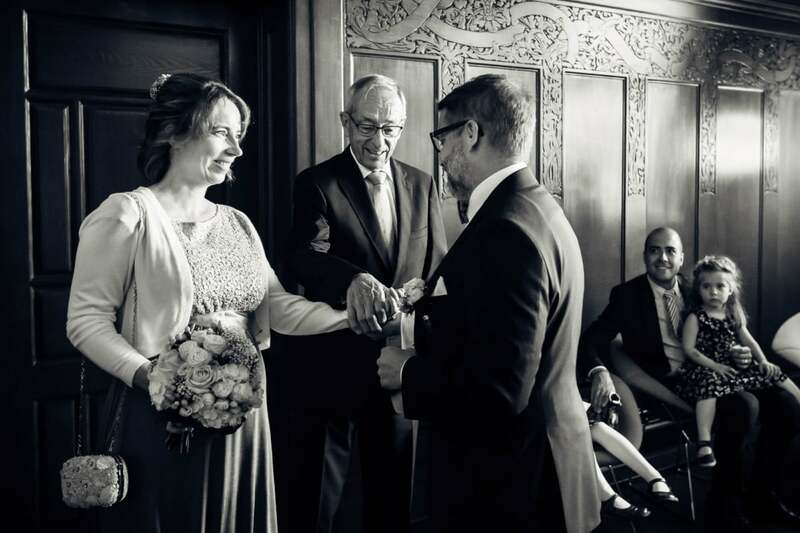 The bride was led classically from her father into the room and handed over to Alexander. At the wedding promise there were a few tears. What a beautiful and emotional moment. A loving and comforting embrace was just right. After the wedding ceremony we used the opportunity to take some photos in the town house. The beautiful symmetry of the arches and the warm light were really inviting. Afterwards the bridal couple was welcomed with soap bubbles. In the warming autumn sun the company let balloons rise with congratulations. On foot we went to the nearby restaurant Carlton. What would Zurich be without the trams? Exactly. Near the restaurant on Bahnhofstrasse there was another short photo session. After a fine aperitif, the dignified lunch took place. Thanks to Barbara & Alexander that I was allowed to be a wedding photographer in Zurich.